Employee breaks leg; goes to the hospital emergency room (e., not the in-patient service of the hospital) where his leg is set and he is given prescription drugs for pain administered before release—Not Reportable because not an “In-Patient” Hospitalization. Employee breaks leg; goes to the hospital emergency room where his leg is about to be set, but patient begins to bleed out, so the emergency room staff replenishes his blood before setting the leg. The employee is then admitted to a ward for monitoring/observation because of the blood loss—Not Reportable because medical care provided in ER prior to admission, and admission was for observation only. Timing of reporting criteria. The new rule requires employers to report a hospitalization, amputation, or loss-of-eye injury to OSHA within 24 hours of when any management representative of the employer learns of the reportable injury. Note, however, that the injury must be reported only if it results in a hospitalization, amputation (except for medical amputations) or loss of eye within 24-hours of the incident. Fatalities still must be reported within eight hours of when employers learn of the death, unless the death results more than 30 days after the underlying incident. OSHA’s new rule became effective January 1, 2015 for all employers in the 30 states where federal OSHA enforces health and safety regulations. The states that operate their own federal OSHA-approved State Programs also are required to implement these changes, but they have discretion to roll them out on a different timetable than federal OSHA. Dramatic Increase in Inspections and Citations. The “catastrophe” element of OSHA’s reporting rule was rarely triggered when it required the hospitalization of three or more employees from the same incident. Lowering the threshold from three employees to a single employee is expected to dramatically increase the number of reportable incidents, from at most 50 a year to more than 25,000. OSHA has long prioritized incident inspections over programmed inspections, and experience tells us that OSHA does not leave incident inspections without issuing citations. Accordingly, the revisions to the “Fat-Cat” rule are likely to dramatically increase the number of incident inspections that OSHA conducts, and therefore the number of citations issued. Public Shaming. Also troubling is concern over the purpose to which OSHA will put these new injury reports. The agency intends to use these reports in the same way it uses embarrassing and inflammatory press releases that accompany allegations in citations — to publicly shame the employer. Specifically, OSHA plans to publicize all reports of fatalities and severe injuries on its public website linked to and searchable and sortable by the employers’ names where the injuries occurred. OSHA stated in a news release surrounding the release of the new rule that it believes public disclosure of the injury reports will incent employers to ensure a safe workplace for their employees. This, of course, wrongly pre-supposes that workplace injuries are a result of employers not providing a safe workplace, and unfairly lumps all workplace injuries into a single bucket, regardless of the cause. Electronic Reporting and Inadvertent Admissions. 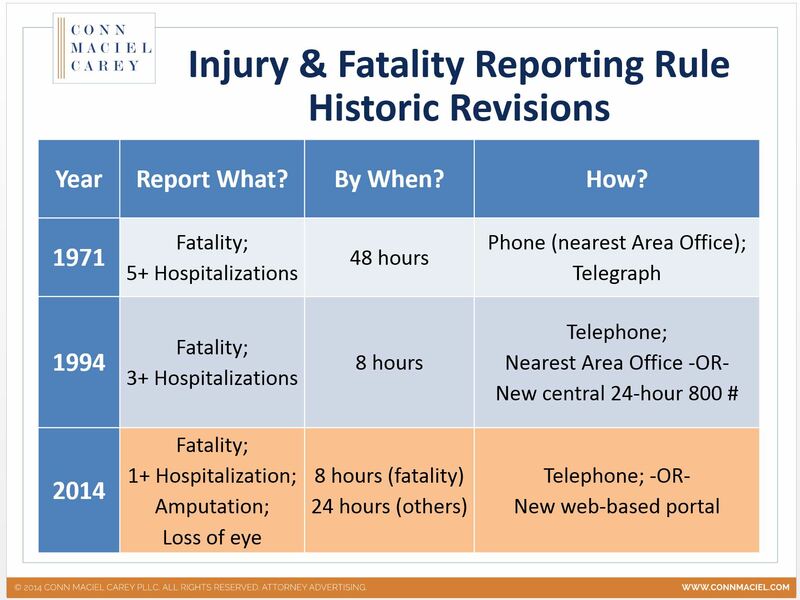 A final concern about the new rule is the introduction of a web portal by which employers can electronically report incidents, in addition to the historical telephone reporting options (i.e., calling OSHA’s 24-hour hotline [1-800-321-OSHA] or the nearest OSHA Area Office). Employers should be wary of using this web portal to report incidents because it requires a detailed written explanation of an incident that has just occurred a few hours earlier, and for which a thorough investigation could not yet have been completed. These preliminary descriptions will be memorialized as the employer’s statement of the event, and could later be used against it as an admissions in an OSHA enforcement proceeding or a personal injury or wrongful death civil action. Indeed, anyone can access these written reports through a Freedom of Information Act request, including plaintiffs’ attorneys, union organizers, the media, your competitors, etc. Accordingly, the old-fashioned telephone call should remain the preferred method of reporting. For all other types of incidents, and for those for which OSHA exercises its discretion to not inspect, OSHA will utilize its new “Rapid Response Investigation” (RRI) protocol. 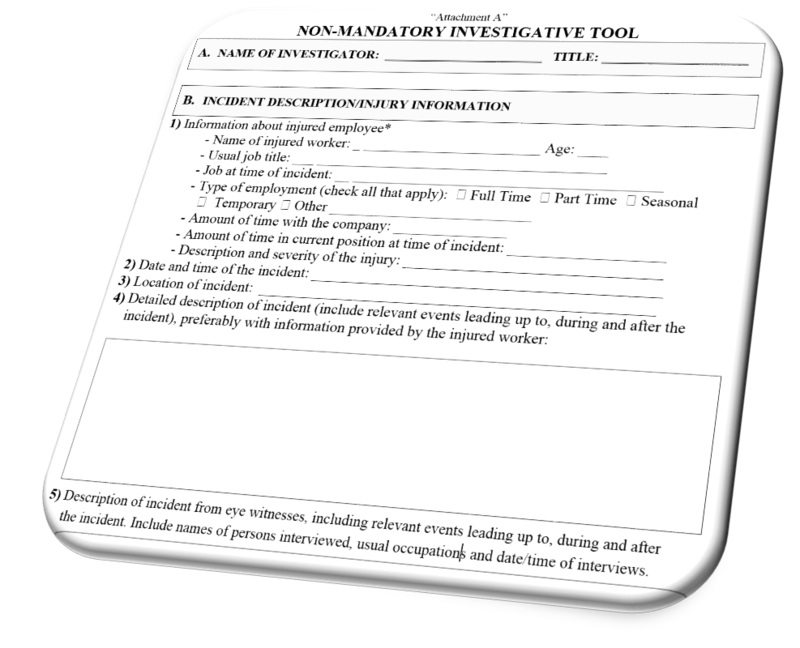 Under the RRI program, the employer will receive an RRI letter, which asks the employer to conduct an accident investigation, document the findings and corrective actions, post a copy of this letter where employees can review it, and submit the findings and corrective actions to OSHA. Through the first six months of the new reporting rule, OSHA initiated inspections for 35% of the reported incidents, 20% were determined to not be work-related or not covered by the new reporting requirements, and for the remaining 45%, OSHA utilized its new “Rapid Response Investigation” protocol. 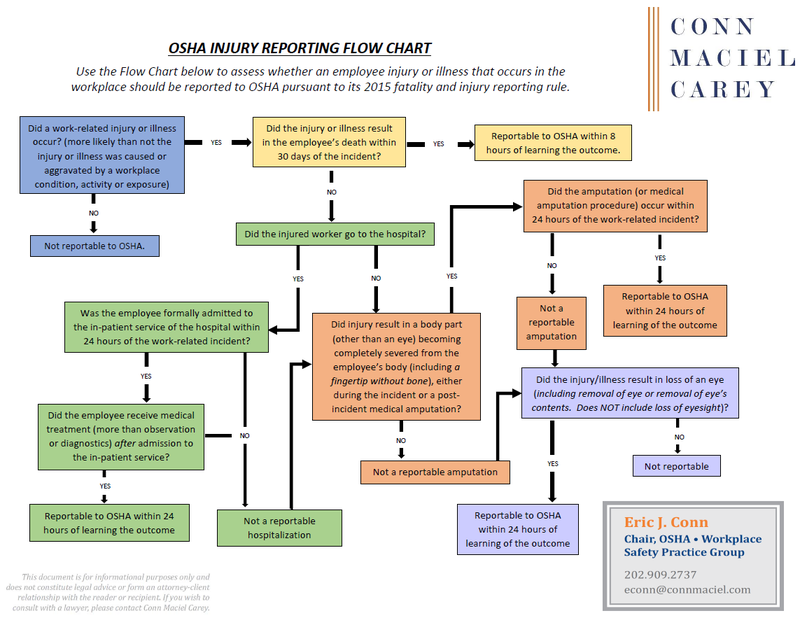 For more information about OSHA’s new Injury and Fatality Reporting rule, check out this link to a recording of a webinar about the new rule conducted as part of Conn Maciel Carey’s 2015 OSHA Webinar Series.